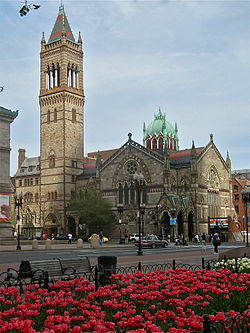 The bell of Boston’s Old South Church tolled mournfully today at exactly 2:49 p.m. , commemorating the exact time one year ago that the first of two bombs went off at the Boylston Street finish of the Boston Marathon. As thousands gathered for what was billed as a Tribute, pewter-gray skies opened in memory of the four dead and hundreds injured. Even so, a continuing sense of recovery suffused the crowd lining the roadway, some who had returned for the first time since April 15, 2013.